The date and location of the 2019 Apex Challenge has now been confirmed. The event will take place on the weekend of 11-13 October at a brand new location in North Yorkshire. For the first time, the competition will be held at Ampleforth College in North Yorkshire. There are extensive grounds which will be perfect for hosting three days of adventure. 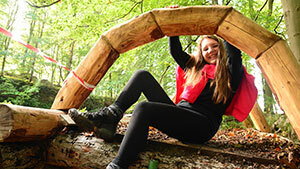 Make sure you have the date in your calendar and we will soon announce more details on how you can enter your team to take part in Scouting's ultimate adventure weekend. 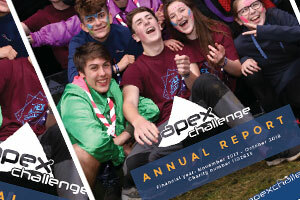 Every year we look back at what the Apex Challenge has achieved in the past 12 months. We highlight the successes and the things that could be made even better in the future. It's all contained in our latest annual report which we are now ready to publish. So what did we achieve in 2018? We returned from a year away with fresh enthusiasm and new ideas to make Apex an even more unforgettable weekend than ever before. We had new activities and a new location which had never been used for our full weekend event before. Saturday night's new glow party was made even better with a fantastic new band and seeing so many smiling faces at the end of the event shows it will be remembered for a long time to come. Apex doesn't come cheap and the report shows how the event was staged at a cost of around £15,000 and with the help and support of some 170 people. As we begin making plans for our 2019 event, looking back at last year is really important so take a read and look forward to our new Apex adventures which are currently being planned. Details coming soon!